I currently run ICHA 3.51 with a Z-Stick S2 from Aeotec. I have ICHA configured with the Beta Z-Wave Controller. I used Tools>Z-Wave Commands>Add Device to add my Schlage lock to the system. All of this works fine. BUT - ICHA does not update the status of the lock when it is manipulated manually (not through ICHA). It does not track the status (locked, unlocked) unless the command is issued though ICHA. I'd like to know when it is unlocked as well as if the status changes to drive scenes and/or rules. Ideally I'd also like to manage codes and audit their use via ICHA too. Once done, you should be good to go assuming we've already coded for your flavor of locks. If manual unlock/lock doesn't work, please open up a support ticket and include your logfile.txt with it so that we can analyze and update for your lock. Ryan - First off: This worked. Thanks. Any idea when you may support user codes and audits? Will it be through a plug-in? When I right click on the lock and select "Setup Lock Codes...", I get a child window titled "Door Code Management". It has two colums: "User ID" & "Code". There are 30 user ids, all of the codes show "?". I have manually programmed 4 codes in the lock at this time, (I don't want to loose them, although I can reenter them if necessary). Should ICHA be reading those codes? is this a symptom of an unsupported device/protocol? I used ICHA to set a code (I used slot 9 hoping to avoid previous codes) ICHA gave an error indicating that it couldn't program the lock and suggested delete and try again. BUT the code does work on the lock keypad and slot 9 now has a row of ** in the code field. So maybe it is the "read from lock" that is not working? That sounds like a very real possibility.... or it could be that the Schlage lock you use doesn't support reading the actual code from the lock. What model # is it? I have a Schlage BE469 and have the same issue. When I modify or enter a code, IC reports an error but the code is actually saved. Apparently the problem is in acknowledging the change by the lock. If you tell me how to grab the logs, I can send them to you. I have Schlage BE469 Model #23685159 and currently run ICHA 3.114 trial version. Ran into the same issue "ICHA gave an error indicating that it couldn't program the lock and suggested delete and try again. " However, enter code works. Also none of my code have been recognized by the ICHA. Only ** for each entered code. I have only 2 days remaining on my Trial version. It seem I cannot get too much help on resolving this problem which makes me to look into other type of software or such in order to set up my home automation. Your best bet if you need support is to open up a ticket at our support site - http://incontrolha.uservoice.com. It works. I can lock/unlock it from Axial server or my phone. I am trying to figure out if there is a way to determine the user who unlocks it via a code. I can understand if the actual code is not transmitted over zwave, but I am hoping the slot number (looks like 1-30) of the code is transmitted which in essence tells me which code/user was entered. I tried the "user code entry" parameter, but that seems to just be a indicator that a code was used. There is also a "access control" parameter and "user lock entry" paramter that I am unsure of its function. Did you try to run an auto configure on it? Doing this on the Kwikset locks I know will cause the lock to send a notification to Axial control for lock and unlock events. I do not know if Schlage supports this but you make it a shot. Here is what I can see currently after entering a code and using the lock/unlock button. I think this is everything I saw when I first set it up. (sometimes parameters that are visible initially will "disappear" later. I think this is just because of how battery devices try to conserve power.) I am curious about the 'access control' parameter. I need to create several more user codes and see what numbers come up. It would also be nice if I could grab the edge of the Axial server window and change the size to allow longer parameters to be fully displayed. I believe the one you are interested in is the "User code entry" - in the example you provided, "1" means the first code slot was used. Heh. That was the first one I looked at. But I noticed that when I unlocked using the key or inside knob, it stayed at zero, and when I used the code, it changed to one. I thought at first that it was only telling me that a code was used and would only show a 0 or 1. But I just tried the other default entry code that came with the lock and it now says 2. So I think you are correct. Awesome. It suddenl;y stopped working with zwave. The lock itself still works with all of the programmed codes. But ifi click lock or unlock in Axial, it will change the icon to locked or unlocked respectivel;y, but the lock itself does nothing. And if a code isused, it is not reporting it to Axiel. I have removed the device from thezwave network. That appears to work as expected. The device gives a green checkmark, and Axial says that it has been removed and prompts me to remove the represented device as well. Then, if I try to add it back in, Axial will report that a device was added and will add the representation in the device list. But the lock itself will come back with a red X which indicates that it was not successful. And I still have no control. I have even performed a factory reset on the lock and changed the batteries. I also have a zwave repeater close by, so distanceshould not be an issue. We are going out of town this week and will have friends coming over to take care of the dogs. I would like to get notifications of when they are here. Any help is greatly appreciated. I assume you are adding it using the Axial control menu in tools/zwave/network wide? How do I add a Schlage BE 469NX lock to Axial running as a Secondary Controller? 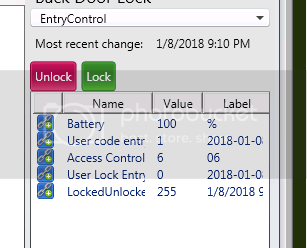 I successfully added the lock to my Primary controller and verified functionality, but when I add to Axial using ZenSys Tool, the lock shows up in Axial, but does not work (press lock and icon changes, but lock never locks). Associating device with main controller...... Fail! Successfully subscribed to event notifications." I spent several hours trying different things. Any help would be greatly appreciated. If the lock is already included with a different device, you won't be able to include it a second time until you first remove it from the other device. There's also no way to add it using zentools and expect it to work in Axial because there are security keys that Axial has to set as part of the inclusion process. Without those keys, Axial will be unable to communicate with the lock. Generally speaking, a secure device can only be used by the primary controller unless you can figure out how to share the keys between both controllers. Axial can do this in the options, but your primary controller has to support it.